Last week we looked at copywork, the whys and the hows of including it in the modern homeschool. This week, I hope to inspire you with a few resources that you may find helpful in assigning copywork for your children. The number one living book, of course, is the Bible. I often have our children select passages that we are currently studying and I like to vary the translation used. A particular favourite for copywork is the King James version. We use this version occasionally to read from, but I enjoy it a lot for copywork. The language is rich and beautiful. Most of the Bibles in our home are not King James, so I find it much more convenient to obtain a passage online. I really like this site for finding Bible passages. It is simple to search for various translations and it is a snap to paste selections into Word, change them into a suitable font and print them out for a child to copy. Another fabulous online resource for copywork is the Ambleside Online copywork yahoo group. A huge number of the books Ambleside suggests for reading have selections chosen specifically for copywork purposes. The file section contains a wealth of great passages from a large number of common books. Whether you are using Ambleside Online or not, this group is terrific since it has copywork selections from books your child has probably read and enjoyed. As for print resources, our children enjoy using The Harp and Laurel Wreath: Poetry and Dictation for the Classical Curriculum by Laura M. Berquist. This is a well-known book in homeschool circles, which can be used for a variety of things besides copywork. We have also made use of it for recitation and, as the sub-title suggests, for dictation. Another big favourite around our home is Bartlett’s Familiar Quotations. Our children love to find quotes from famous people whose lives they have studied. (They particularly love the obscure quotes!) A searchable, online version can be found here. Poetry is probably my children’s favourite thing to copy. We make use of many different poetry books, but the one we come back to again and again is Favorite Poems Old and New compiled by Helen Farris. It contains hundreds of poems, listed by topic, which I find very helpful. The arrangement makes it fantastic for finding poetry to add to a nature notebook, or for finding a poem on a particular topic of interest for a child to copy. It is a great resource which we have enjoyed for years. Do you have other favourite online or print resources you like to use for copywork? I’d love to have your ideas included. Just add a comment in the comments section. Sorry…my day was packed full, so I was not able to write up a post for you today. I will be posting on Copywork Resources tomorrow as part of the Charlotte Mason Basics series. See you then! This ensures that the children and I learn to pick up our things after we use them, or at least relatively soon after. Charlotte Mason was a huge believer in training children in good habits and orderliness is one habit that did not come easily to me. I want it to come much easier to our children. However, my children would tell you that they don’t enjoy hearing me bark at them all day to pick up their stuff. I don’t enjoy barking either. So, I try to use a variety of things to make tidying time more pleasant. The first is attitude. We are tidying because it brings us pleasure and calms our minds to have tidy, serene surroundings. We can find things easier and we don’t have to shove stuff aside every time we want to use a table or an area on the floor. It is also much less embarrassing when people drop over. It feels good to be able to welcome them in without having to worry that the place is a mess! So, cultivating the attitude that tidying our home is a blessing to us and others makes it more pleasant to do the work than to leave the children thinking tidying is a punishment. As far as the actual tidying part goes, I find the best way to get the children to tidy happily is to work alongside them. This can be a hassle if I have something else to do, like making lunch or caring for a baby, but it makes all the difference in the world. What looks like just a few things to you can be an overwhelming job for young children, particularly if you have a child who is not inclined to look after their things. One of my children, when told that it was tidy time said, “But Moooooooom, I can’t clean up because I’m toooooo lazy.” Isn’t that the truth?! Finally, I have found that some kind of encouragement along the way works wonders. I have a little song that I sometimes sing while we tidy. I learned it from the Waldorf school years ago when we attended a parent and tot class. However, you can easily make one up to a favourite tune (Row Row your Boat, Twinkle Twinkle, etc.). Basically, you just start singing about what you are tidying up, or what needs to be tidied up, while you work. The children just seem to join in like magic. It doesn’t work every time, so I like to mix it up a bit. I also use the high five system, which is a particular favourite. I will tell each child one thing at a time that needs to be tidied. “Please pick up the puzzle and put it in the bin.” Then, as the task is completed the child runs to me for a high five. This works really well and helps keep things from being overwhelming. Before they know it, the room is done. What things do you do to encourage your children to tidy their surroundings? I’d love to hear some ideas. Isn’t this the cutest thing ever?! It was a nice, quick project from the current issue of one of my very favourite magazines, Living Crafts. I promised myself I would not to cast on the snowman until I had finished two knitting projects I already had on the go — the socks I posted the other day and a pair I had almost finished for Steve. I finished Steve’s socks yesterday and cast on this little guy last night. 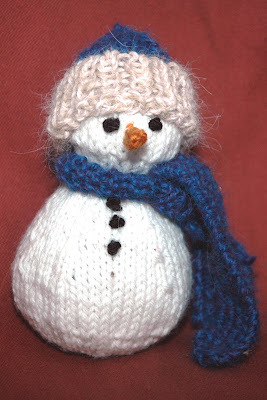 I’m going to have to make a few more of these for our winter decorating! You can click the above pic to enlarge and see the detail. 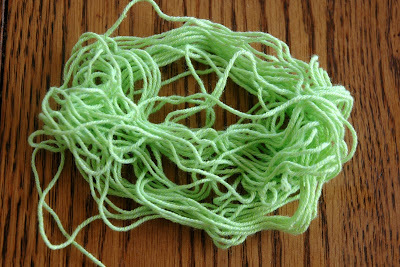 And, just for interest’s sake, here is the amount of yarn I had left. Trust me…it isn’t very much! In case you didn’t see it, today’s installation of Charlotte Mason Basics is underneath this post. I don’t know how to get it to be first! You know, one thing I truly love and appreciate about Charlotte Mason’s method is how inexpensive it can be. Using her methods, a child can have an excellent education making liberal use of the library and materials from home. Copywork, like narration, is another one of those facets that are simple and inexpensive, but very powerful. Charlotte’s methods are freeing to me as a mom, too. Because of their simplicity, I don’t have to try to decipher a complicated curriculum or do a lot of mental gymnastics to dream up a new way to try to get my children to learn something. In Charlotte’s schools, learning was natural and made common sense. ( If you are just joining us, you may wish to read through the Charlotte Mason Basics previously covered.) We have looked at narration already and have seen that our children begin to learn story composition by retelling the stories in the high quality literature they read. Similarly, our children learn grammar, spelling and penmanship by doing copywork, that is copying worthwhile portions of literature precisely and in their best handwriting. Children still have specific penmanship lessons and in our modern home, these take the form of completion of the Getty-Dubay series of workbooks on Italic Handwriting. Ideally, the children would be doing specific penmanship lessons alongside copywork, but in our home, I find it more practical to work on the italic workbooks at the beginning of the year and then move to focus exclusively on copywork. Our older children each have an attractive, lined journal-type notebook for their copywork, as I hope this will be a treasure they will want to look at again and again in later years. Younger children (about grade 3 and under) need to copy from a separate page specifically made for them in the style of handwriting I want them to use as opposed to the original source, so I find it more practical to give them a binder with page protectors. Older children in our family use a fountain pen purchased at the local Waldorf school, while younger children just need a pencil and an eraser. Older children can choose their own passage or have one assigned. To encourage variety, I like to have a mini-schedule. The selection needs to be somewhat challenging. As they get older, watch for opportunities to encourage children to learn the use of quotations/quotation marks, to include challenging vocabulary, and to practice difficult spellings or unusual punctuation. Also, the selection needs to be long enough to be appropriate to their age. As with narration, we are going for quality. 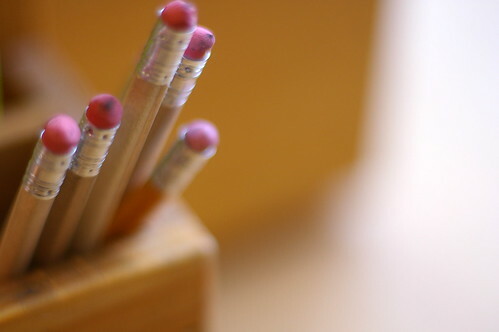 You are aiming to end the copywork before the child gets tired and bored and the writing becomes sloppy. This trains them to do their very best work. It is better to have one line done beautifully than a page full of sloppiness. Also, keep in mind that it is not necessary to finish a passage during one session. You can make it an ongoing work. For example, a child might copy one verse of a poem each day until it is completed. I also encourage our children to add a beautiful coloured border or small illustration to make their work even more aesthetically pleasing. We certainly don’t do this every time, but it is definitely a special part of their books. Next week, we will look at some great sources for copywork, some books and some online sources.